A fresh dinner idea that's ready in 3 easy steps! Toss potatoes with oil; place, cut sides down, on half of parchment-covered rimmed baking sheet. Bake 20 min. ; turn potatoes. Spread asparagus onto other side of baking sheet; bake 5 min. Meanwhile, place fish on separate parchment-covered baking sheet; brush with 2 Tbsp. dressing. Add fish to oven with vegetables. Bake 10 min. or until potatoes are tender and fish flakes easily with fork. Drizzle vegetables with remaining dressing; toss to coat. Sprinkle Parmesan over vegetables; sprinkle parsley over fish. Serve with lemon wedges. Prepare using Kraft Extra Virgin Olive Oil Greek Feta Dressing or Kraft Calorie-Wise Zesty Italian Dressing. Prepare using individually wrapped frozen tilapia fillets. Thaw in refrigerator before baking. 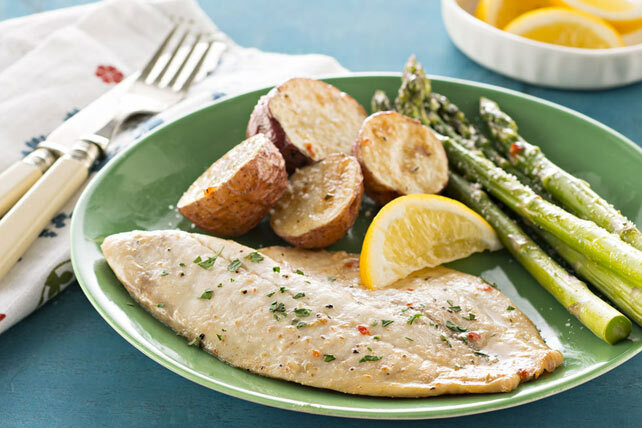 This delicious fuss-free fish dinner can help your friends and family eat right. And as a bonus, it provides an excellent source of vitamin C, per serving.